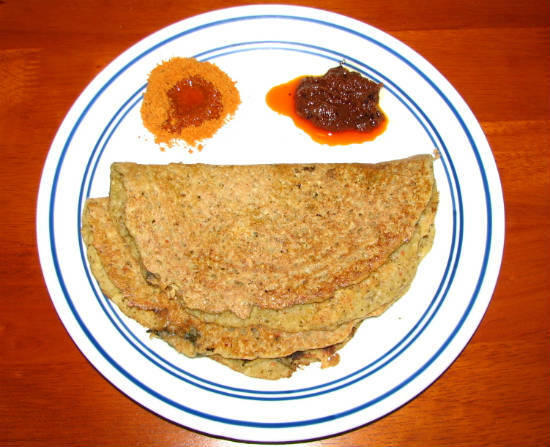 Adai is a common breakfast or evening dish from Tamil Cuisine. Often served with “Avial”, Adai is also best relished with chutney and sambar. 1. Wash the rice and urad dal together and soak for 1 to 2 hours. 2. Wash and soak the toor dal and bengal gram dal for 1 to 2 hours. 3. Drain the rice and urad dal. 4. Add red chillies and saunf. 5. Add enough water and grind to a smooth batter. 6. Similarly drain the toor dal and bengal gram dal. 7. Drain them to a coarse batter. 8. Combine both the batters. 9. Add onions, turmeric powder, salt, curry leaves and asafoetida powder. 12. Pour a ladleful of the batter and spread evenly. 13. Add oil around the edges and cook on both sides. 14. Remove and serve hot with chutney and sambar. 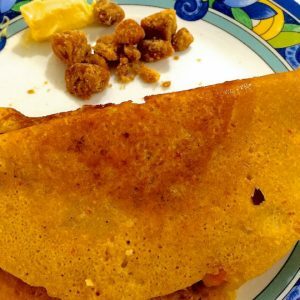 Feel free to comment or share your thoughts on this Chettinad Kara Adai Recipe from Awesome Cuisine.